People learn the importance of backing up system when there’s something wrong with the operating system, which, however, is usually too late, especially for system backup. Backing up computer system timely and regularly is a wise and effort-saving move for those who are tired of complicated steps of system reinstallation or don’t know how to reinstall OS. Still some may frown on system backup, for most system backup software is not easy to use or requires users should have a deep understanding of specialized knowledge about system backup and restore. So here I’d like to recommend a piece of easy-to-use system backup and restore softwar. This system backup program, developed on the basis of PartitionGuru, is different from system backup software that adopts the kernel of Ghost. This program is designed for common computer users with a wizard interface which can finish the whole backup process just by clicking mouse button for several times. 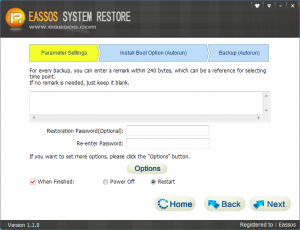 Eassos System Restore supports incremental backup which only backs up changed parts after the first full backup, so that it saves time and hard drive space. 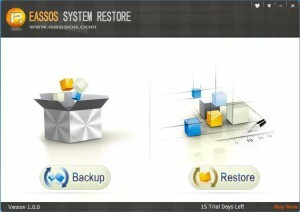 Besides, you can restore system to any time point created by every backup. The first step of system backup is setting parameters, which has been set by the program in accordance with the actual hard disk situations. In most cases, the default settings are optimal, so it’s OK to click “Next” button without changing any options. 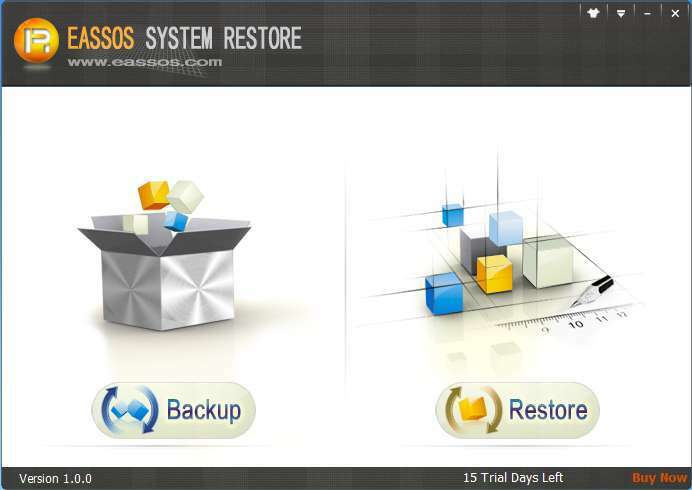 Eassos System Restore supports incremental backup and restoring system to any time point. And you can add a remark for every backup, serving as a reference for system restore. 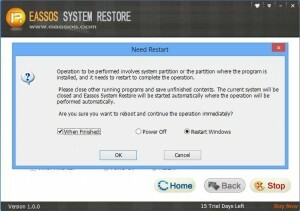 Besides, you can appoint the operations after the system backup, shut down or restart Windows. If you want to modify the default settings, click the button “Options”. It is not advisable to change those default settings unless you have a deep understanding of system backup and restore, because in most cases, those default settings are optimal. Here is the interface of setting parameters. As the operation involves disk’s underlying part, following operations might be blocked or warned by anti-virus software as in the picture below. 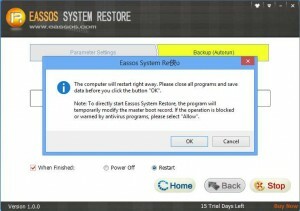 There’s no need to be anxious, for Eassos System Restore is absolutely safe and won’t do any harm to computer. 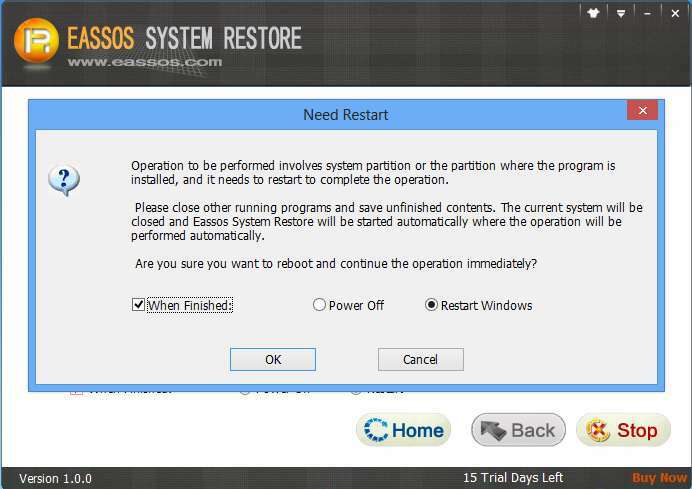 Then Eassos System Restore will restart and enter DOS version automatically to perform system backup. The backup speed is very fast, which is usually above 1GB/min. Thus it won’t take long to back up Windows 7! If you followed the default settings in previous steps, the program will restart Windows when it finishes system backup. 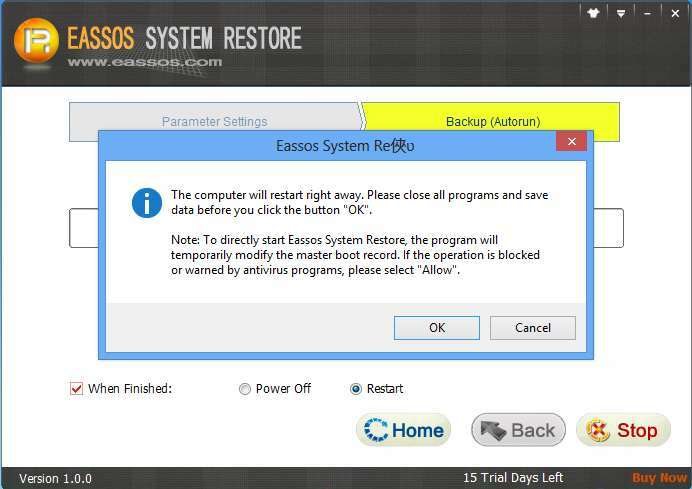 This entry was posted in Backup & Restore and tagged back up Windows, Eassos System Restore, system backup, system restore by EASSOS. Bookmark the permalink.